Joel Silver's long-running obsession with making a movie of DC Comics' classic WWII hero Sgt. Rock is apparently moving closer to coming true, with a screenwriter and director rumored to be involved... and revamping the character into a science-fiction actioneer? 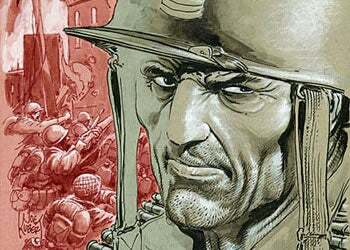 According to Empire Online, I Am Legend director Francis Lawrence and screenwriter Chad St. John are planning to take DC's war veteran into the future with the adaptation, in order to overcome studio nerves about a period setting and racist wartime attitudes. If true, this suggests that not only does Warner Bros. miss the point of the character altogether (Sgt. Rock is a series about a soldier in World War II! The time frame is the entire point! ), but also that we have another potential comic-to-movie disaster on our hands. Then again, Lawrence has experience of both, having directed the Hellblazer adaptation Constantine, starring the not-so-British Keanu Reeves.